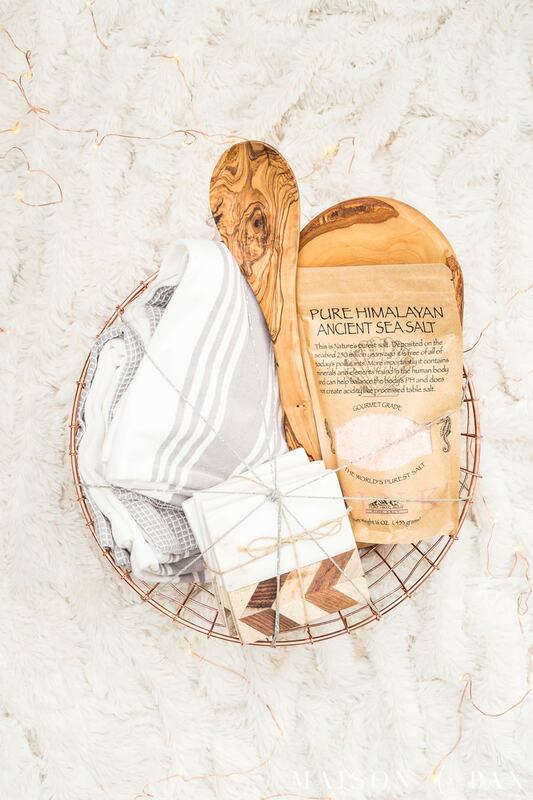 Home gift ideas are perfect for hostess gifts, teacher gifts, kids presents, and more. 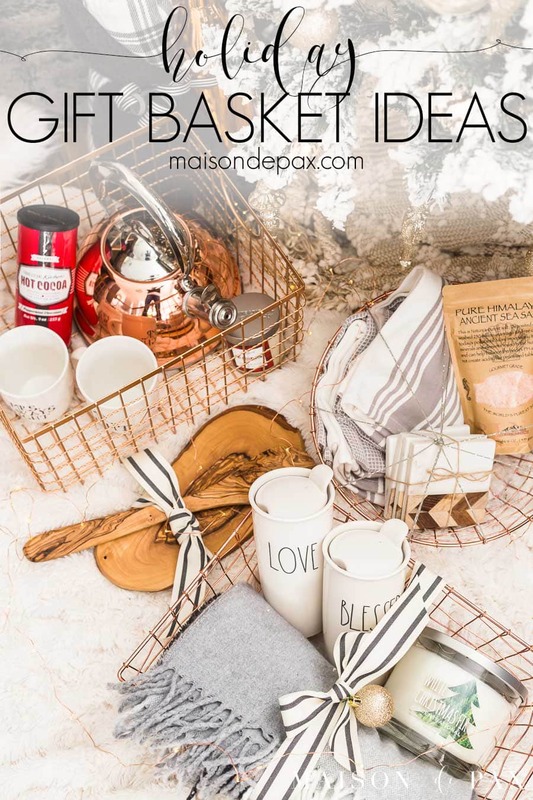 Check out these easy gift basket ideas for the holidays! This post is brought to you by T.J.Maxx . While this was a sponsored opportunity, all content and opinions expressed here are my own. This post also contains affiliate links. Click here to read my full disclosure. I have a brother who begins his holiday shopping in July. July, y’all! For the rest of us (myself included) though, there are many gifts yet to be purchased, I’m sure: gift for family, friends, and all those special people in our lives. 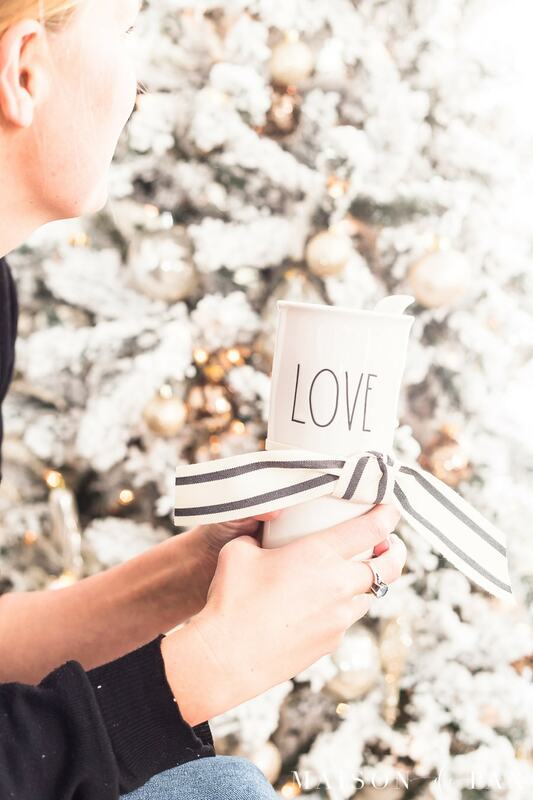 I’m so excited to partner with T.J.Maxx today to help you find some of those gifts this holiday season. 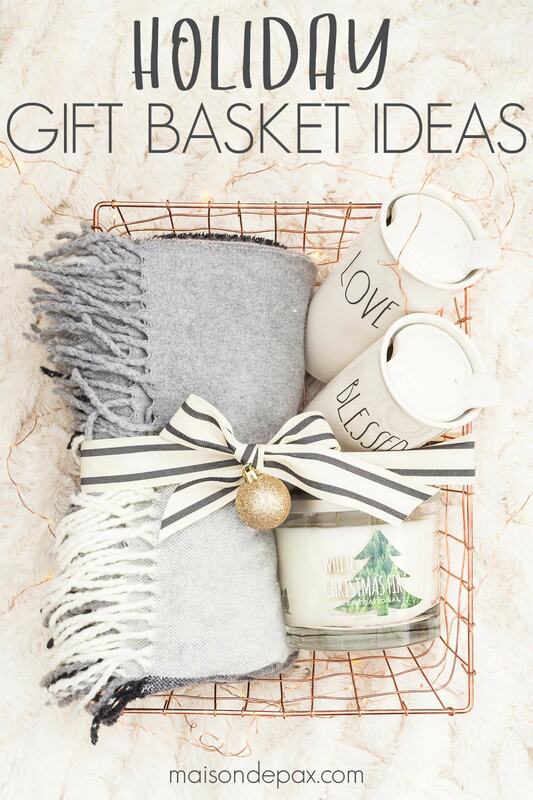 And better yet, I’ve got some super cute gift basket ideas to make it easy for you! 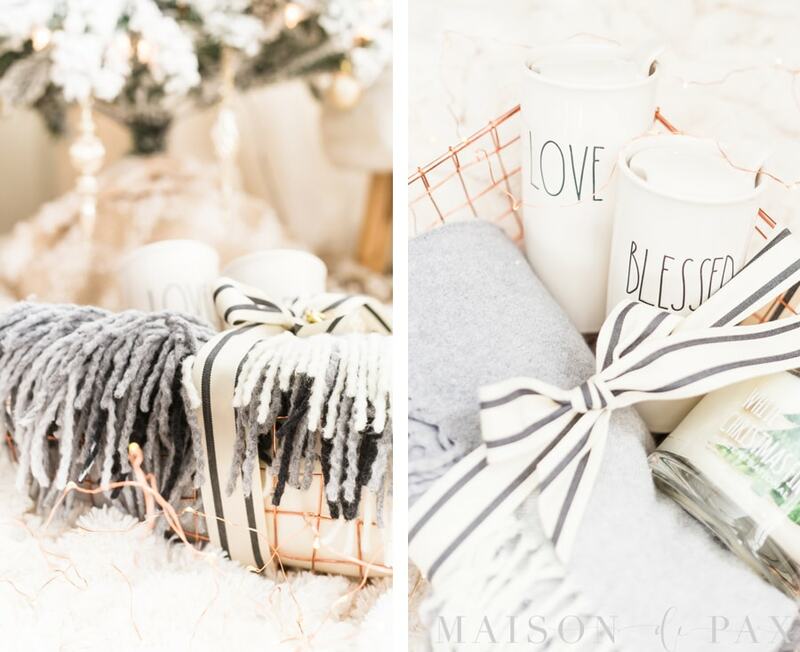 Kitchen accessories, home decor, and cozy accents… I love giving home gifts for the holidays because whatever the size – a college dorm room or a dream home – your loved ones live somewhere, and home gifts can brighten that in some small way. 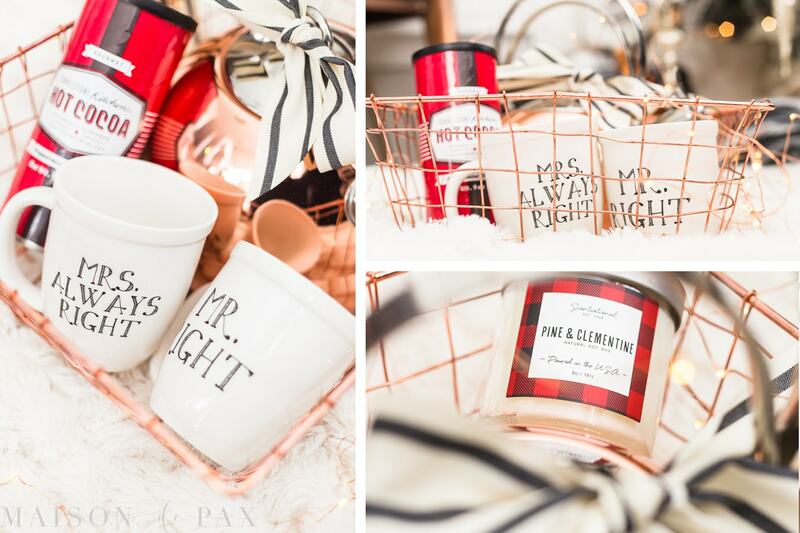 T.J.Maxx not only has a fabulous variety of home gift ideas in store, they even have an online “gifts for home ” list (so if you’re the type who refuses to shop anywhere after mid-October except the comfort of your own bedroom, they’ve got you covered!). 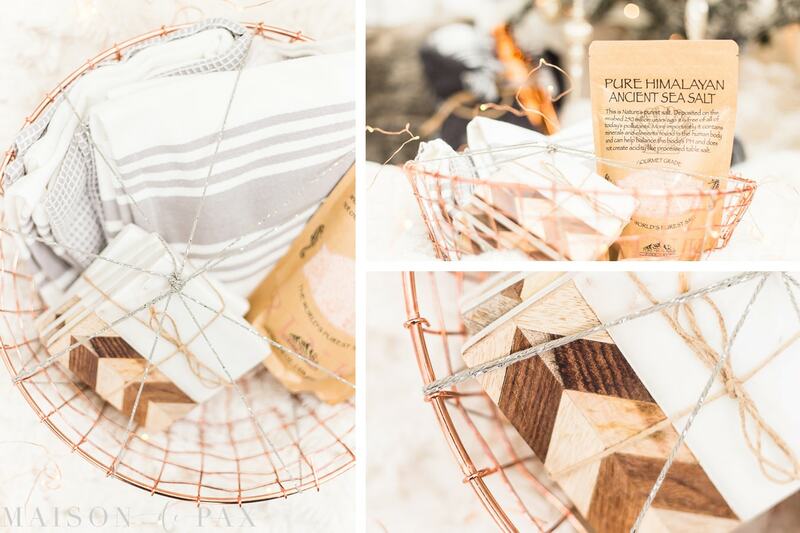 And gifts from the home section make the most adorable gift baskets. Here are four gift basket ideas to get you started. 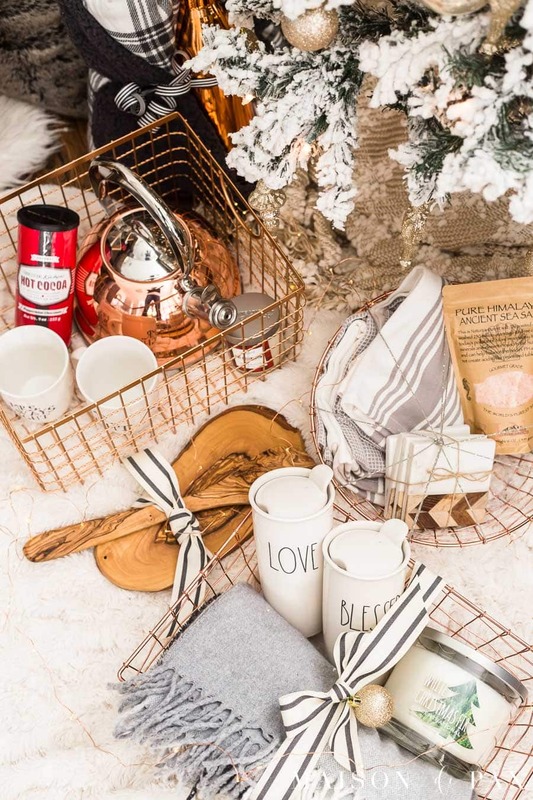 You know I love copper, so this copper basket was the perfect way to corral a beautiful copper tea kettle, some adorable mugs, delicious hot cocoa mix, and a cute candle to set the mood. This fun gift basket would make a perfect teacher gift or friend gift. Find tons of great basket options here ! From gourmet salts to gorgeous dish towels, T.J.Maxx’s home section has a wonderful variety of gifts for the kitchen lover. Just look at those gorgeous marble and wood coasters I found! You can check your local T.J.Maxx or browse online for more options! And again, a copper wire basket is the perfect base for this gift. You can shop their kitchen and dining room items online here . Speaking of kitchen and dining room, are you attending holiday parties this year? Spending Thanksgiving at Aunt Ruth’s and Christmas at Grandma’s? Don’t forget your host or hostess gifts! Kitchen and tabletop gifts are perfect for those who enjoy opening up their homes for the holidays, and the gift “baskets” don’t always need to be elaborate. I love that T.J.Maxx.com actually has gift ideas organized by price point: gifts under $10 , $10-30 , and $30-50 . So convenient, and perfect to help you find gifts for everyone on your list. And with hundreds of new arrivals each week , both the early gifter and the last-minute shopper can find something unique. 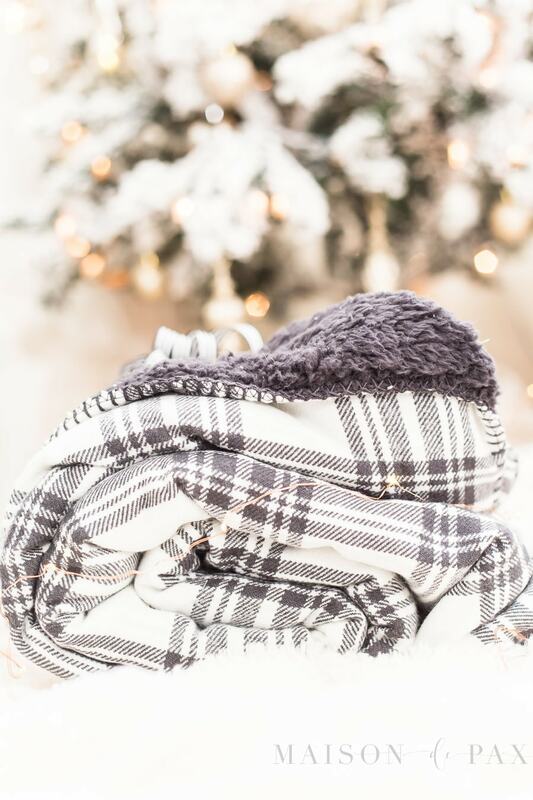 Just layer one or two beautiful home items, tie them with up with a ribbon, and you’re all set. 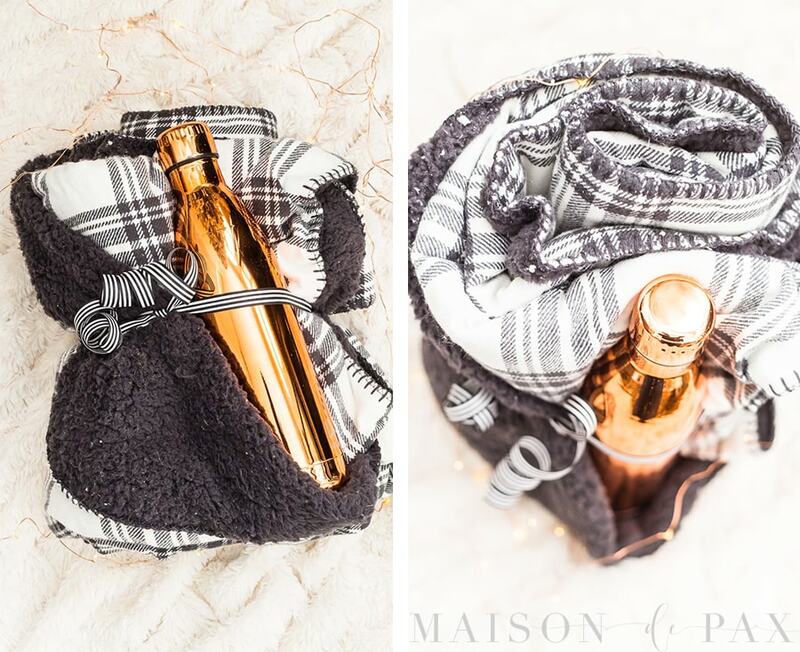 This “basket” idea is really so simple: wrap a fun water bottle in a cozy throw blanket and tie a ribbon around it. All four of my kiddos wanted this one! 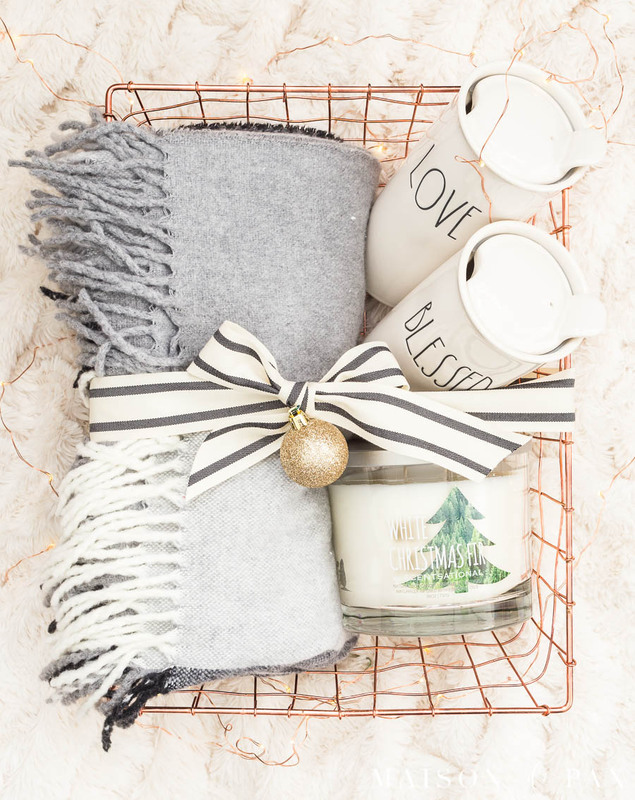 An Italian wool throw, a couple of cute travel mugs, and a huge holiday candle make for a thoughtful, warm gift basket. 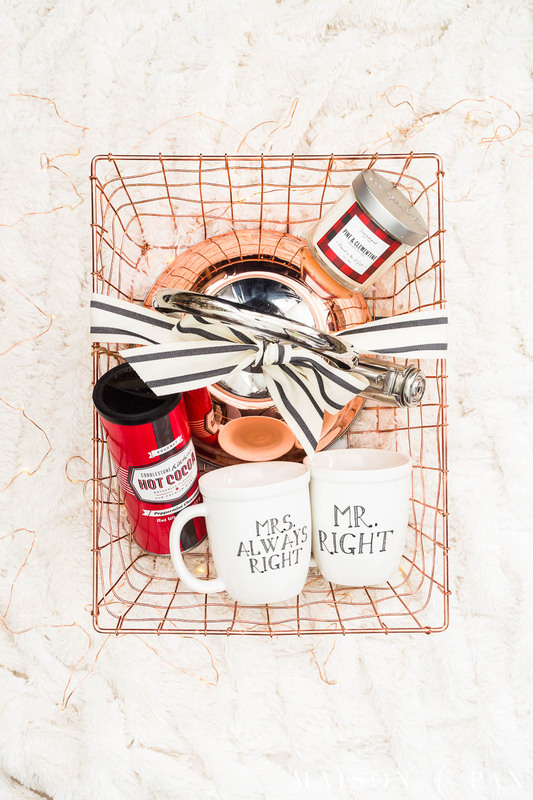 Search for similar mugs and candles online or drop by your nearest T.J.Maxx to put together your own perfect cozy basket. Who are you shopping for this holiday season? Shop T.J.Maxx online to find the perfect present! These are so cute! And such great ideas!! How do you attach the little Christmas ornament to the ribbon? Thank you so much, Angela! I just tied the ribbon in a bow and then bent the ornament hook through the central part of the bow. I hope that helps! Great ideas. Not completely suitable for an Australian summery Christmas- but can easily be replaced with fun, sunny substitutes such as beach towels or kimono beach wraps, sun hats, thongs (what you might call flip-flops) and some spf 50+ sunscreen. 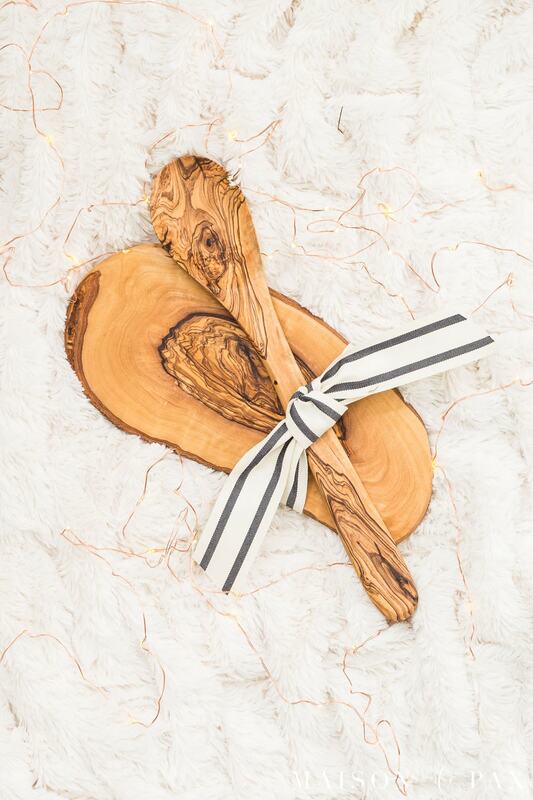 I might actually just try to make that cute cheese board and wooden spoon at some stage. My woodwork always looks pretty rough so these will be acceptable, I hope! This is such a cute idea for a Christmas gift. Can you please tell me where you hit your ribbon? I love it!